This week has been a pretty mixd bag weather wise. Sun and wind at the start of the week and then thankfully at the end of the week the wind has dissapeared and the sun has shone warmly. I have booked a long weekend this weekend so yesterday morning I spent re potting my stock succulents and new cuttings in a more sandy compost mix ready for winter. I have also got the cold frame out the shed and have insulated it with some polystyrhene pads that I have recycled from work and have placed some of my tender succulents in there. 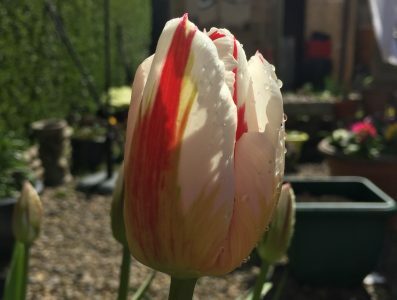 Last Sunday I potted up my first tulip pots and realised I had a load of big pots left so I have bought some more Tulips to plant up a couple of more so next Spring the garden should be over flowing with Tulips. I will plant the new ones this weekend along with the 4 new varieties ao Alliums I have bought. 1. Echerveria Duchess of Nuremberg. A fairly hardy Echerveria this one survived tbe Beast from the East with out issue. It has only produced one offset but as you can see it is nice and compact. The plant adds to the Autumn palette of colour. The flower behind it is Sedum Warburtons Pizzaz a smaller version of some of the larger Hypotelphiums like Autumn Joy or Carl. I have noticed it starts sprouting a little bit later than normal Sedums in the eary summer but it soon catches up. Another Autumn coloured plant this one adds colour to a largely green border. I have bought 4 new Heucheras this year and I have planted them in a row in one of my front garden borders. Some Heuchera’s particulary the neo green and purple ones can be garish but others can add valuable colour to the garden especialy through winter. I have to admit however I have got a garish neo green one but that is to contrasr from a red one…honest! As some of you may ha e realised I am addicted to succulents. I had said a couple of months ago that I would not buy any more succulents this year but I had a relapse and bought 8 new ones from Surreal Succulents. As always the plants are top class and very vibrant. I can’t wait till next Spring so I can put the on the patio and let them grow. Roll on March. Planted tbese cuttings into a more sandy soil yesterday. It’s my first year of taking cuttings on this scale and it will be interesting to see how they turnout over the winter. If you read some of the websites they do say that the best time to take succulent cuttings in the spring. I have also got about 40 succulent leaves lying on a window sill and it will be interesting to see if any of them sprout roots. I am not holding up much hope TBH but you never know I might strike it lucky. These 2 pictures show how growimg succulents in different types compost affects the size, shape and colour of a plant. Both plants were taken off the same parent plant. The top one is grown in an ordinairy multi purpose compost with no drainage in a plastic pot and the below one is planted in the dry trough with has equal patts compost and horticultural grit. As you can see the top one has fsr more fleshy broad leaves with a bluey grey hue. However the bottom plant is more compact and the leaves are tighter and have red and orange tips, also the plant looks a little more “crisper” but still healthy but a little stressed like me sometimes. This alpine grows like it is on steroids. I have already cut it back 4 times this year but it just bounces back with more vigour. It produces a plethora of golden yellow flowers in late spring and looks spectacular. Definitely a star of the front garden. Well that is my SOS for this week. I hope you have enjoyed it. I am off to enjoy what looks like another sunny day and will be plantkmg more tulips. Love the trough in number 3. Do you make them yourself? Seeing your succulents each week has inspired me to add more to the few that I had from my Dad’s garden. It’s becoming a bit of a collection now! Your Duchess is looking healthier than mine – maybe I should try planting her out or in a trough? That Heuchera is a beaut too! I am planning an alpine bed so a rampant Erysimum sounds like a good start. It sounds like a rachehorse….and Rampant Erysimum is comimg up on the outside…. Hi Jane jt is worth notong that the Heuchera is not a succulent. I knew that, but probably caused confusion by commenting on two things in one sentence! Wow, #5 was quite a surprise. I would never’ve guessed they were from the same plant. I like both versions, but is there a reason to keep them ‘distressed’? Not really just excited experimenting …. Someone else just featured ‘Duchess of Nuremberg’ echeveria! You likely saw it already. It did not look quite like yours. Neither of them seem like they would get much photosynthesis done with such purplish gray foliage. Where is the chlorophyll? I suppose that is part of the reason why my bronze houseleek is so small. The main reason is that pieces keep getting stolen. That trough is great. Perfection in miniature. That very pretty heuchera drew my eye. You mention pots overflowing with tulips in spring. Sounds excellent.